Following the fall of Baghdad, two Iraqi boys stumble upon armed men looting the city zoo. The floodgates have been opened for the smuggling of hundreds of exotic birds, mammals, and reptiles to Western nations, but this crime hides a deeper secret. Amid a hail of bullets, an underground secret weapons lab is ransacked–and something even more horrific is set free. Seven years later, Louisiana state veterinarian Lorna Polk stumbles upon a fishing trawler shipwrecked on a barrier island. The crew is missing or dead, but the boat holds a frightening cargo: a caged group of exotic animals, clearly part of a black market smuggling ring. Yet, something is wrong with these beasts, disturbing deformities that make no sense: a parrot with no feathers, a pair of Capuchin monkeys conjoined at the hip, a jaguar cub with the dentition of a saber-tooth tiger. They also all share one uncanny trait–a disturbingly heightened intelligence. To uncover the truth about the origin of this strange cargo and the terrorist threat it poses, Lorna must team up with a man who shares a dark and bloody past with her, now an agent of the U.S. Border Patrol, Jack Menard. Together, the two must hunt for a beast that escaped the shipwreck while uncovering a mystery tied to fractal science and genetic engineering, all to expose a horrifying secret that traces back to mankinds earliest roots. But can Lorna stop what is about to be born upon the altar of Eden before it threatens not only the world, but also the very foundation of what it means to be human? In this stand-alone thriller from author of the Sigma Force novels, Dr. Lorna Park, a researcher at a high-tech facility dedicated to preserving endangered species, teams up with a border patrol officer, Jack Menard, to track down the people responsible for a boatload of genetically modified animals found beached on a small island near the cost. The book is written with Rollins' usual emphasis on history, cutting-edge science, and fast paced adventure, and the villains are carefully drawn and supplied with sufficient intelligence and motivation to make them feel like real people—and not cardboard-cutout bad guys. The two leads make a good team—there's a personal undercurrent to their relationship—and, as in all of Rollins' books, there is a series of questions, puzzles, and mysteries to be sorted out before the book's rousing conclusion. Readers who detect something different in this novel, a sense that the author is perhaps personally invested in this story than usual, aren't imagining things: Rollins is a practicing veterinarian, and his affection for animals comes through pretty clearly. 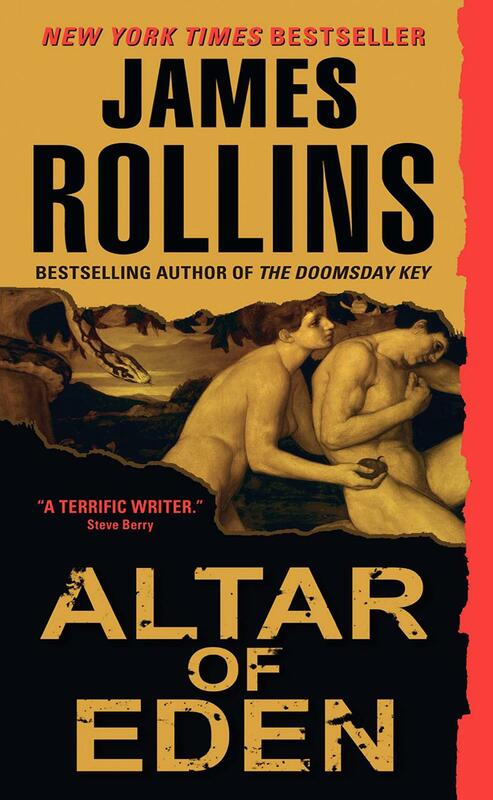 A very good thriller and further proof (after his earlier stand-alones, not to mention his recent adaptation of the latest Indiana Jones movie) that Rollins is as sure-footed on new ground as he is in the familiar Sigma Force World. Q. And I see you decided to make Dr. Lorna Polk a woman. Actually, you have a huge female following. How are you able to get inside the mind of a woman so well and what made you want to write from the point of view of a woman for this book? When I was in veterinary school, half of the class was composed of women. Since then, that percentage has continued to grow. So I thought it would be appropriate to tell the story from such a fresh perspective. I also grew up with three brothers…and more importantly, three sisters. When it comes to getting inside the mind of a woman, they keep me honest. They’re still my best first readers. And since I was breaking ground writing a new subgenre anyway—the first veterinary thriller—I thought I’d have a woman take the reins in what is normally a male-dominated genre. But I didn’t want to write a female Rambo. I wanted to flesh out a real woman with a rich history, one tied to New Orleans where the story takes place. So Lorna Polk came into being. Q. Another aspect of your thrillers that appeal to women is the romantic themes throughout your series. Does Lorna have a romantic interest? She does. Jack Menard is an elite member of the Border Patrol. And like Lorna’s family, he has roots in the New Orleans area. But unlike Lorna’s history of plantations and Garden District mansions, his family is Cajun and have their roots buried deep in the bayous and swamps of that region. And though the characters come from two different worlds, they also share a dark history from their youth, one they sought to keep secret. But some secrets refuse to stay buried. Q. Another concept that you include in ALTAR OF EDEN is the idea of a higher, collective intelligence. Do you believe in the notion that animals can think together? Do you believe this type of intelligence already exists? Something is definitely going on, something beyond our current understanding. One of the scientific phenomena explored in this novel is the human-animal bond—the strange and deep affinity humans have for animals, an affinity that goes beyond mere affection or need for companionship. The presence of animals has a profound effect on people: petting a cat triggers an immediate drop in blood pressure, animals brought into hospital wards boost immune responses in patients and accelerate healing times. Yet, it remains a mystery why we have this bodily reaction. Current research is exploring for the roots of this strange bond. In this novel, I offer my own theory. But to tell you more would ruin the story. Q. As a veterinarian, how do you feel about the genetic experimentation that is one of the foundations of ALTAR OF EDEN’s plot? As with the case at ACRES, innovative research into genetics can be of great benefit, holding the potential to save hundreds of species from extinction. But with all such technologies there are risks of abuse. It’s one of the themes I love to explore in fiction, to look beyond the cogs and wheels of new technologies and explore the moral implications of abusing that technology. And such a challenge is not unique to this century. I open this novel with a very telling quote from H.G. Wells: The study of Nature makes a man at last as remorseless as Nature. It’s a question faced with any scientific inquiry: where to draw the lines. In my novels, I love to to step over those lines and explore the strange and dangerous territory on the far side. Q. In ALTAR OF EDEN you delve into the concept of private military contracts with a scientific research company called Ironcreek Industries who are experimenting with some pretty scary things. There has to be some sort of regulation for this type of experimentation, RIGHT? While there might be some regulation for labs within the United States, once you cross the borders it becomes a scientific free-for-all out there. With so much government money currently being poured into private military contracts—both to defense contractors and to the broader scientific community—competition has grown fierce and with it come abuses: including corporate espionage, vandalism, outsourcing to third-world countries to avoid regulations and safety standards, and unfortunately even darker crimes. While Ironcreek Industries was invented for this novel, its abuses are far from fictional. Q. I’m sure many fans of the SIGMA series are panicking, wondering when they are going to see Gray Pierce, Painter Crowe and the rest of SIGMA again. Why don’t you quell their fears, when can we see the next SIGMA? It comes out next summer (July 2010). In that book, a major storyline that has been building over the course of the series comes to a head, and all Hell breaks loose…in this case, literally. It’s titled The Devil Colony and it’s a huge story. Q. Much of the book is set at ACRES, the Audubon Center for Research of Endangered Species. What is this center for? You say it’s not open to the public, but have you visited? If not, where did your ideas for this center come from? ACRES is a real facility associated with the Audubon Zoo in New Orleans. The research building is located within a secluded thousand acres alongside the Mississippi River. The main goal of ACRES is to use cutting-edge science to preserve endangered species and hopefully pull them from the brink of extinction. To this end, they employ techniques such as artificial insemination, embryo transfer, even cloning. Back in 2003, they were the first to successfully clone a wild African cat. They named the kitten Ditteaux (pronounced Ditto). I love their sense of humor and knew Lorna would have to work at that facility. Q. One of the true scientific gems you include in ALTAR OF EDEN is the idea of “genetic throwbacks.” What exactly is a genetic throwback and is it possible for my next kitten to be born with saber-tooth fangs? The scientific term for “genetic throwback” is atavism. It’s a real phenomenon where a genetic trait, lost for generations, returns in an individual. In this novel, one of the many creatures featured is a python born with reptilian limbs, a throwback to a time before the snake’s ancestor lost its legs. I thought I was making this creature up, but a couple of months ago, I stumbled upon a scientific article about a Chinese snake born with a fully functional reptilian limb poking out of its flank. For the curious, a quick Google search will bring up a picture of this snake. It just goes to show that nature is full of surprises. Q. What else is on the horizon for James Rollins? Always another book or two or three. In the spring of 2010, the second novel in my kid’s series debuts, titled Jake Ransom and the Howling Sphinx. Then, as mentioned above, the next big Sigma book comes out in the middle of summer. I also have two short stories in a pair of upcoming anthologies. Then next winter, I have another surprise in store, something I’m not at liberty to discuss yet. So there’s much more to come! Q. Where did the story of ALTAR OF EDEN originate? It started with lunch. I was having a conversation with my editor at HarperCollins. She asked me a question that I heard too often while I was still a practicing veterinarian: Why haven’t you ever written about a vet, something like James Heriott’s All Creatures Great and Small? My short answer was “Because not enough people die in those Heriott novels.” Back then, I was working fourteen to sixteen hours a day as a vet, and I didn’t want to go home at night and write about one. I wanted to spin exciting stories of suspense, adventure, and exotic locales. So I told my editor at that lunch that if I were ever to tackle a veterinarian story it would still have to be a thriller. Based on that conversation, the story began to build in my head. What if a veterinarian stumbled upon an exotic animal smuggling ring…but something wasn’t quite right with the animals? From there, the story grew quickly. And yes, like in all my novels, many people do die. Q. You are known for your extensive and intensive research. What amazing adventures did you undertake in researching/mapping the plot of ALTAR OF EDEN? For the first time as an author, I got to follow the old adage: to write what you know. Of course, that applied only to the veterinary aspects of the story. For other details, I spent way too much time out in the swamps, learning such details like alligators like marshmallows, raccoons are good swimmers, and July is a very bad month to be out in the bayou. I also just listened. It’s amazing the stories and tales I heard from locals (many of them shocking and unfit for print). And of course, I ate my way through the culinary masterpiece that is New Orleans. Such is the sacrifice an author must make. Q. Your SIGMA series has been incredibly popular. In fact, the most recent entry, THE DOOMS DAY KEY, hit #2 on the New York Times bestseller list. What drew you to write a stand-alone thriller now? After writing six Sigma novels, I was ready to tackle an independent story, one free of baggage and recurring characters. It was also a chance to return to my writing roots. My first five novels were stand-alone adventures. Each book was an attempt to capture some of the spirit of adventure found in the pulp novels that I grew up reading, paired with the wild imagination of writers such as H.G. Wells, Jules Verne, and H. Rider Haggard. My first novel (Subterranean) was compared to Verne’s Journey to the Center of the Earth. My second (Excavation) was described as a modern update to Haggard’s King Solomon’s Mines. And it’s no coincidence that Altar of Eden begins with a quotation from H.G. Wells. The quote comes from his novel The Island of Dr. Moreau, where strange experiments are performed on animals. Q. Your SIGMA series is set across the globe and finds your characters in far flung locales such as Antarctica, Tibet and Africa. Most of ALTAR OF EDEN is set in New Orleans. Why did you choose to center most of the story in one locale? And why New Orleans? I love New Orleans. I’ve visited the city at least a dozen times—both before and after Katrina. I’ve toured alligator farms, traveled the bayous by airboat, walked its cemeteries by candlelight, visited plantations in the middle of July’s swelter, stolen bread from Commander’s Palace, and avoided guessing what that smell was on Bourbon Street. There is simply no other city like it in the United States. Despite the hurricane, the city abides. There remains an unmistakable vibrancy to the place, a rich blend of cultures, and a haunted quality that has been speaking to authors for ages. Q. You’re a busy guy, do you ever sleep? Sleep? I’ve never heard of such a thing. Tell me more. Fill out the form below to create a review for altar-of-eden. Your review will have to be approved first before it will show up on the site.